It seems as though this is one of the worst winters for sickness! Maybe it’s not, statistically speaking, but everywhere I look someone else is coming down with something! Is there anything that you can do to prevent sickness? Well, yes. I think there are many measures that you can take to strengthen the immune system. 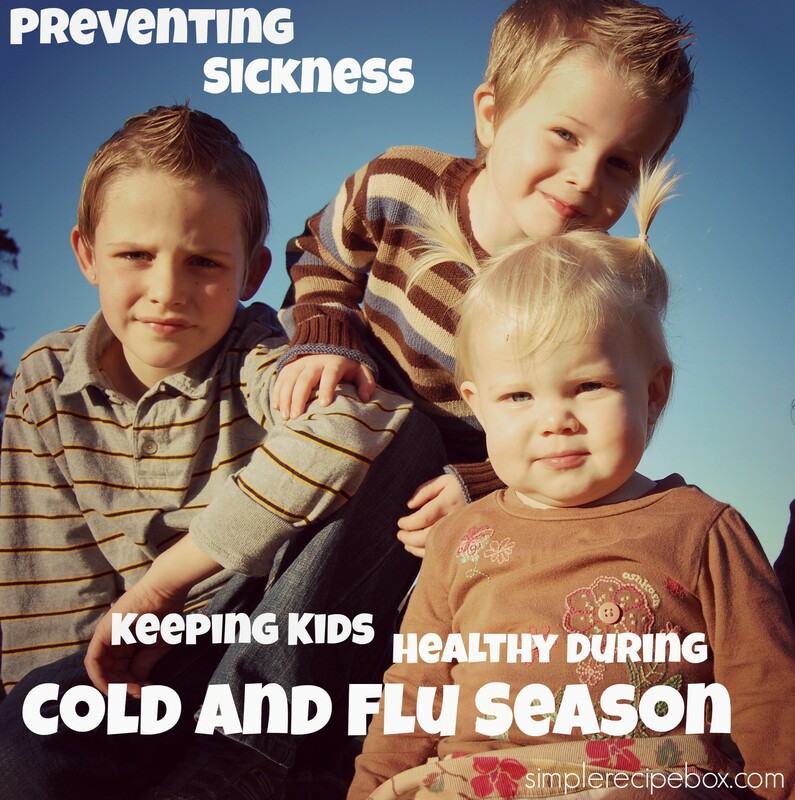 This post outlines a simple approach to preventing sickness and keeping your family healthy during cold and flu season the natural way. If your desire is to be able to avoid the doctor’s office this winter, and hopefully avoid antibiotics, then you’ll have to make some choices. Choosing to go the natural route in treating your body requires you to do some things that others may not be willing to do. There is no guarantee that even if you do all of this, sickness will never come knocking. But it does give you a better chance at having a strong immune system that is ABLE to quickly fight off sickness if it comes. So what can you do to maintain a strong immune system? I am not a doctor, nor am I here to diagnose anyone. These are the things we have done to keep our bodies strong and healthy and to avoid the doctors office-antibiotic cycle. In fact, we have not had to utilize these things for over 10 years. Our doctor is around for well checks and physicals but other than that we don’t need to see him. We are both happy with this relationship. The first area that needs to be addressed when talking about your immune system is your diet. More specifically, the amount of sugar and junk that is in your diet. You cannot expect your body to be at peak performance if you are feeding it take out and candy bars every day. A whole foods based diet will help you build a strong immune system. The saying, “You are what you eat,” really is true. Put careful thought into what you are feeding your family. Your body has to interact with a lot of toxins in your environment every single day. If you are additionally bogging it down with lots of processed foods and sugars (mostly sugar), you can’t expect it to stay strong and healthy. Sugar is a sneaky little thing. It hides in so many foods, the packaged kind anyway. I am not a whole foods nazi by any means, but you have to be eating MORE real food than junk food, and low sugar (refined carbs) if you want to stay healthy. You just do. While organic is always best, do the best you can with what you have. Make up your mind that you WILL find a way to eat well, and then work at it. It’s increasingly difficult to help your kids eat well when they are at school and being offered all kinds of goodies. The only advice I can give is to try to cast a vision for them to grab a hold of, find some way to make them want to make good choices. How you do that is up to you, you know your child best and what motivates him or her. Another option is to have something for them to “switch” out the junk food for either a healthier treat that they love, or some kind of reward. This way, they can bring the junk food home, give it to you and receive a treat or reward in return. Do whatever you have to do to encourage your kids to make good choices. Apples, carrots, celery with home made dip, granola bars, jicama sticks, cauliflower poppers or cookie dough bites are all healthy snack options. Or make your own trail mix with raw nuts and seeds and very small amount of dried fruit (without added sugar). Rethink the snacks that you are giving your kids and try to come up with some low sugar options. One of the best additions you can make to your diet for improved immune function is fermented foods and drinks. Kombucha, kefir, creme fraiche, properly fermented sauerkraut (such as Bubbies brand), or other fermented veggies. Find something you and your family like and start there. Make sure sugar isn’t hiding in your drinks either. Juice is pretty much all sugar, so instead get your kids used to drinking water. Add lemon or flavor it with some fresh fruit, but I would advise against giving your kids sugary drinks on a regular basis, during the winter especially. Sugar is the number one enemy of your immune system. Research suggests that your immune system is suppressed from 30 minutes to a full 5 hours after the consumption of sugar! So while your little fighters are working hard to fight off sickness and disease, if you feed your body sugar, you compromise your whole system and bam! You get sick. Are you convinced yet? So many people do not realize how much sugar they are actually consuming daily and can’t figure out why they get sick so often. If you are frequently getting sick, having to use antibiotics yearly, or dealing with chronic coughs and such… examine your diet. The answer might be staring you in the face. Our bodies are fighting with toxins, germs, bacteria etc. on a daily basis. You have to be supplying your body with more arsenal to fight off these things. As much as I would like to think that you can get all you need from eating a perfect diet, I don’t think you can. Not today. First of all, many of us don’t have the discipline or desire to eat 100% perfectly all the time. Secondly, our food is not as nutrient dense as it was 100 years ago. It’s just not. Even if you eat all organic, you will probably still have nutritional holes. Now I’m not going to go crazy on recommending supplements, but I am frequently asked what I give our kids, so I will tell you what they take regularly. They take a multi-vitamin. I like the Garden of Life Raw kids. It’s a fantastic price, it’s all organic, high quality, and whole foods based. You can get it on amazon or vitacost online. It has worked really well for our family for many years. In addition, I make elderberry syrup and they use it daily as a preventative , especially during the winter. You can read more information about the benefits of Elderberries here. They also take fermented cod liver oil. This remedy has been used for a long time to keep kids immune systems strong, I bet your grandparents even took it. No, it does not taste good, but WHO CARES! IT WORKS! Often natural remedies taste awful, but I’d rather my kids get used to that than thinking that everything should taste like candy. Not to mention, if a vitamin tastes like candy, it has fructose or another sweetener in it –WHICH IS MOST LIKELY SUGAR people! The third thing they take is magnesium powder. This helps to keep them regular (which is extremely important to good health-get used to it, I talk about poop a lot), it helps them sleep better, and also calms nerves. 80% of Americans are deficient in magnesium! I wonder how many health issues would be solved if people just started getting the proper amount. This is the powder we like to use, everyone takes it before bed to help with deep sleep and everyone loves the way it tastes. I do not ever have to fight them in taking this one! Another thing I’m just adding to the regimen is a vitamin C powder. This is not the artificially sweetened Emergen-C from the store, it’s a pure GMO-free powder that we will use to use every day. It’s also great to have on hand for mega-dosing during a sickness, especially a respiratory one. I will also be using it for my allergies. The brand we are using is Nutribiotic and I got it here. I have 6 kids, they all take their vitamins. Sometimes one of them will fight it, but I patiently still give it to them. It has worked for us for over a decade and with 6 kids. I think it can work for you too. Let them have a chaser of some kind or use the elderberry (which is sweet) as a chaser for the less tasty items. Do whatever it takes to get the supplements into your kids. If you start them off young it will be much easier to continue as they get older. This is a great time to talk about how not everything that’s good for us is easy. Right? We know working out is good for us, but it’s not always easy. We know having a budget is good for us, but it’s not always easy. I know, I know, it’s very cold in the winter where some of you live. Did you know that in a lot of other places in the world they STILL have their kids and babies go out in the fresh air even when it’s cold? They just bundle them up more. Fresh air is necessary for a healthy body. Sunshine is necessary for a healthy body. Make sure that you and your kids are outside as much as is possible. Be wise about weather and clothing and never push it if you are in below freezing temps, but get out every day at least for a bit if possible. If you are lucky like me and live somewhere where the sun still shines most of the winter and the temps are rarely, if ever, below freezing- GET OUTSIDE! If your kids have too much homework to do and never get to play outside… well that needs to be addressed. Please do not over schedule your children to the point that they don’t have TIME to play outside. It is vital to emotional, mental and physical fitness. It’s how we were created. If you do not have much sunshine where you live, you will need to supplement with vitamin D3. Cod liver oil is a good source of vitamin D and Garden of Life also makes an excellent vitamin D supplement. Amanda Box, who is an ND and writes for Home Cures That Works, also recommends Country Life D3. She says her kids just chew up the pills- easy peasy. If it is in your budget, consider regular chiropractic care. When your body is in alignment, you are better able to fight off sickness. My parents started us on regular Chiropractic care when I was 8 years old. There have been times where our whole family was able to get regular care because we found a Chiropractor who was willing to work with us financially. I have not found one willing to do that (yet!) where I live and we are sorely missing it! Many times a good adjustment right at the start of the sickness with knock it right out! Or if you go consistently, you may not even end up getting sick. It’s a proven, natural, holistic way to stay healthy and it really is worth it. You want a wellness chiropractor, not just one who cracks backs, but one who is aware of the holistic approach to health. This kind of chiropractor will also address lifestyle and diet most of the time. I remember a few years ago I had one of my “crunchy” friends and her kids over to play. It was time for snack and I asked the kids to wash their hands. Her son came to me and said he couldn’t use my soap, he wasn’t allowed. I didn’t get it at the time, but I do now. Fast forward a few years and I learned about the dangers of anti-bacterial soaps and hand sanitizer. We stopped using them. We found plain old regular soap, Bronner’s is a great brand, to use at home. I found healthier alternatives for when we were out and about. We all know that hand washing and cleanliness in general is a great way to prevent the spread of sickness, but take a close look at what you are using and make sure the benefits outweigh the risks. For us, regular soap has been much better. One thing I’m not sure the FDA has addressed yet is the potential of anti-bacterial products to contribute to a weaker immune system. I’ve read this many other places however. Not all bacteria is bad, you want to kill the bad stuff and let your body work with the good stuff. Do you have any other ideas of how to keep kids healthy? Thank you for such a wonderfully informative post! The Garden of Life multi vitamin age suggestion is ages 4+. Is there a specific one that you would recommend for under 4? Well, you’d have to talk to your doctor to be sure, but we use 1/2 for ages 2 and up. Also, if you do cod liver oil you may not need the extra vitamins until they are older. Wow, this is awesome and everything I was trying to search up. You saved me a ton of time! Thanks! Also, what brand of fermented cod liver oil do you use? Hi Jayda! The best one is the Green Pastures fermented cod liver oil. If we can’t do that one, we use Garden of Life. Green Pastures can be found for the best price at RadiantLifeCatalogue.com.